We would love to be an encouragement to others. Please fill the short web form below with your friend's name and email address, and a special message will be sent to them on your behalf. Over the years, October has become dedicated throughout the world to remembering and honoring the angel babies that have been lost. It has also become a time to raise awareness regarding this topic and to discuss, educate, and provide resources and support for parents and family members who are engaged in the family building process and/or have lost a child. When a child dies it doesn't matter when or how it occurred, nor does it matter how old they were when it happened, it is a devastating loss. Regardless of the amount of time a child spent in its mother's womb and/or in its family's arms, that baby is, and always will be, a child that is greatly missed. Every parent would be touched to know that someone cares enough to still remember and recognize their child's life. As such, we are strong advocates of Pregnancy and Infant Loss Awareness Month and International Pregnancy and Infant Loss Remembrance Day. We also help to promote the International Wave of Light Celebration that occurs on October 15th of each year. These activities are a critical part of the overall grief, remembrance, awareness, and healing process for all families who have been affected by the loss of a child. 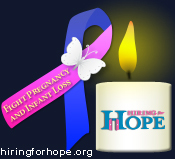 The Pregnancy and Infant Loss Awareness movement began in the United States on October 25, 1988, when President Ronald Reagan designated through a Presidential Proclamation that the month of October should be recognized as National Pregnancy and Infant Loss Awareness Month. The October 15th Pregnancy and Infant Loss Remembrance Day (PAILRD) Campaign began in 2002 as an American movement started by Robyn Bear, Lisa Brown, and Tammy Novak. Together, they petitioned the federal government, as well as the governors of each of the 50 states, and by October 15, 2002 (the first observance of PAILRD) 20 states had signed proclamations recognizing the date as such. This special day was created as a way to honor the memory of all the angel children that have been lost, and promote support, education, and awareness of this topic worldwide. A portion of this special day includes participating in the Wave of Light Celebration. It's easy for anyone to participate. Simply light a candle in your home or in a group or gathering at 7:00 p.m. in your time zone. Keep that light burning for at least one hour. If you do, you will become a part of a continuous WAVE OF LIGHT around the globe that will honor all the children that have left this world too soon. 90,000 children die annually in the United States before their first birthday. Nearly 2,500 babies are lost/year in the United States due to S.I.D.S. Nearly 30,000 babies a year are born stillborn. The number of stillbirths that occur worldwide jumps to more than 4.5 million/year. More babies die as a result of stillbirth than all other causes of infant death combined. Stillbirth occurs ten times more frequently than S.I.D.S. 15-20% of all clinically recognized pregnancies end in miscarriage each year. The average cost to bury a child is $10,000. Yet the average household income in the United States is just over $50,000/year. At the Pregnancy Institute www.preginst.com in New Roads, Louisiana, Dr. Jason Collins, an OB/GYN and Business Partner to Hiring for Hope, believes he is on the track of what may prove to be one of the leading causes of stillbirths. Working with data collected over twenty years of caring for pregnant mothers-to-be, he has concluded that babies are often the victims of simple cord compression during maternal sleep. If he's right, and we believe from our own experiences and those of our members that he is, this could be a major breakthrough in understanding and preventing stillbirth. A virtual location for you to remember and memorialize your lost angel baby. 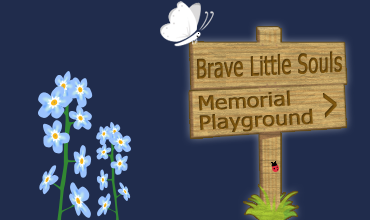 Just fill out the short web form, and then listen to the soothing music as you watch your little angel play in our Brave Little Souls Memorial Ocean Playground. To enter the playground, simply click the wooden beach sign to the left. by following the simple instructions that we have outlined about this special event above. Do a balloon release, or "message to your child in a bottle"
with your family and/or friends. Give each person a note card to write a message to your child(ren), and attach it to the balloons or place it into the bottle. to honor and remember your child(ren). Participate in a planned Oct. 15th event in your area. Click here to see a listing of current events in your area. conducting a memorial fundraiser to benefit Hiring for Hope. By doing so you will make your child's legacy one of helping us with our mission to fight pregnancy and infant loss. Getting started is easy. Simply click the button provided below and follow the few brief steps and you’re done. If you would like assistance with this process, you can email Audra Grossnickle, our Ambassador at agrossnickle@hiringforhope.org and she will be happy to assist you. Consider taking a photo of any special events in order to share them with others by emailing them to: waveoflight@hiringforhope.org In the email, make sure to tell us a little bit about your event. Copyright ? Hiring for Hope. All Rights Reserved.